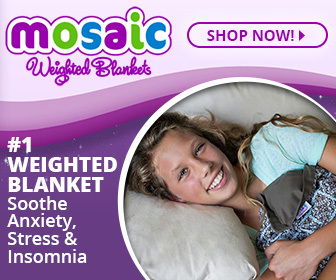 If you’re thinking of trying the deep pressure therapy of a weighted blanket to help ease insomnia, stress or anxiety, you’re not alone. A bit like a soft ‘hug’, the gentle pressure of a weighted blanket is thought to help calm the nervous system and aid sleep. And more and more people are trying it. But many of the weighted blankets out there, particularly those made from fleece, can prove pretty warm. 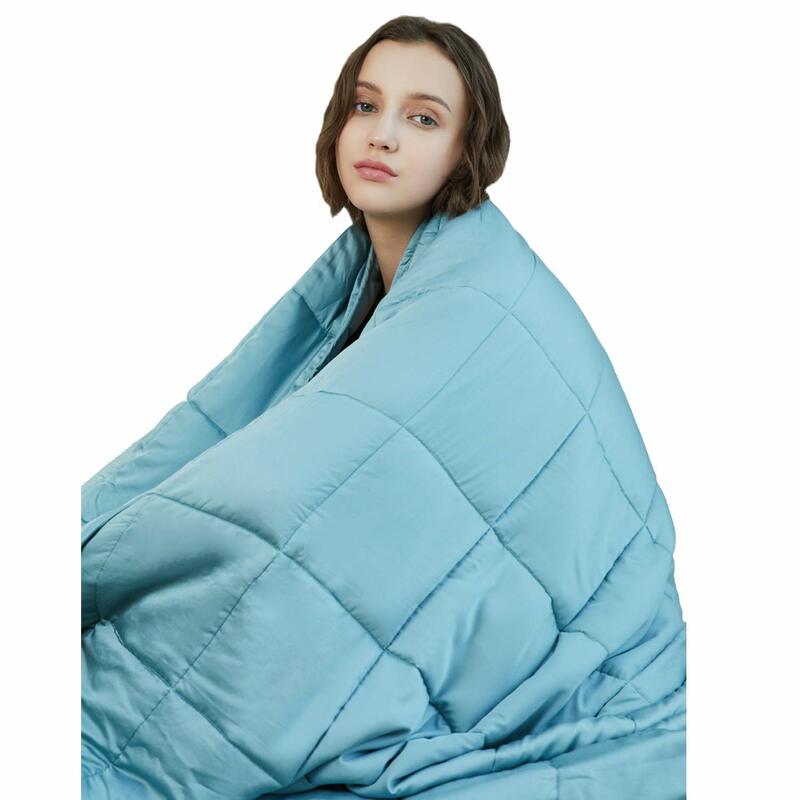 So making the shift to a bamboo weighted blanket, like this one from YnM, can prove a revelation, since bamboo is a naturally ‘cooling’ material. 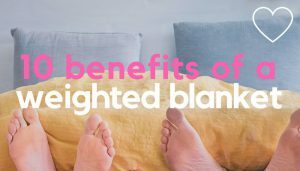 Here are 5 reasons to consider a bamboo weighted blanket for sleep and anxiety. Many weighted blankets use manmade fabrics such as Minky Dot fleece. Whilst cosy and warm, manmade fabrics generally don’t breath well and tend to retain heat. Not very practical if you get hot easily. Whilst cotton is naturally breathable and usually a cooler option, bamboo is even more absorbent. In fact it’s one of the most effective materials out there for wicking moisture away from the skin. It also allows moisture to evaporate into the air quicker than cotton and doesn’t stick to the skin, all factors that help you to stay cool and dry. 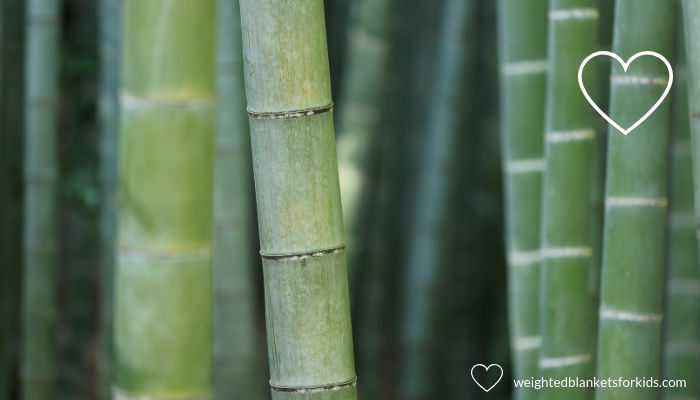 Bamboo is thermo regulating, a process that helps your body maintain its core internal temperature. So as well as being naturally ‘cooling’, bamboo weighted blankets will also help keep you warm in colder winter months, by trapping warm air its fibres. Even though bamboo is breathable, this warm air cools slowly, helping to keep your body warm. This makes bamboo weighted blankets a good option to use year round. Bamboo is an incredibly self sufficient plant. It needs less water to grow than crops such as cotton and regrows quickly after being cut down. In fact, it’s the fastest growing plant in the world, making it a highly renewable source. Bamboo is also naturally resistant to insects or infecting pathogens, meaning it doesn’t need pesticides to grow. 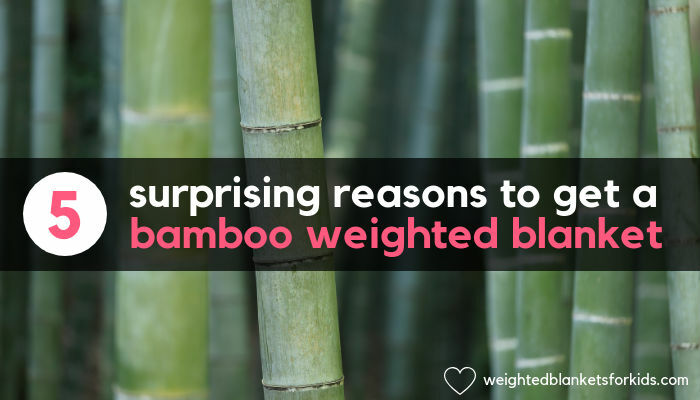 If you’re worried bamboo fabrics might feel a little rough, bamboo viscose or lyocell (usually what bamboo weighted blankets are made from) is very comfortable. In fact many people find bamboo fabrics softer and silkier to the touch than many 100% cotton fabrics. Bamboo fabrics also tend to drape well around the body and are anti-static, so you don’t need to worry about any annoying ‘clinging’. Bamboo fibres also generally require less dye for their coloration. Whilst durable like cotton, bamboo fabrics are also less prone to wrinkling. 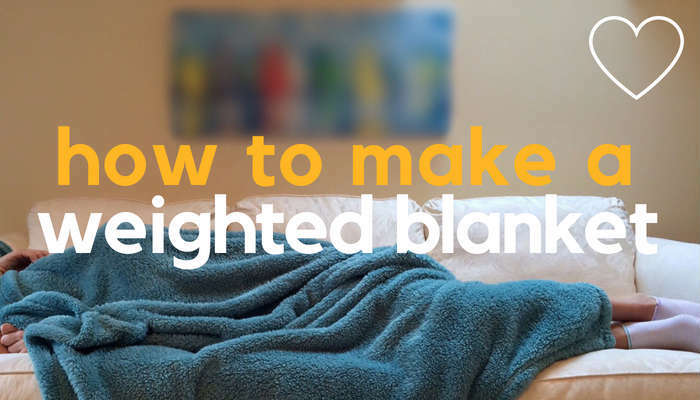 Sometimes it can feel like you only need to look at cotton for it to shoot forth some wrinkles, so you should find a weighted blanket with a bamboo cover needs less ironing than a cotton counterpart. Bamboo Viscose or Bamboo Lyocell? The bamboo fibres generally used in bamboo weighted blankets are bamboo viscose and bamboo lyocell. Both involve a manufacturing process to create them, but bamboo lyocell is generally considered the greener option, since it undergoes a less intensive production process. However, this ‘may’ mean it’s more expensive. 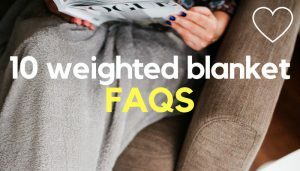 Below, you’ll find 2 bamboo weighted blanket options – one that uses bamboo viscose and one that uses bamboo lyocell. Both use micro glass beads as the weighted filling. 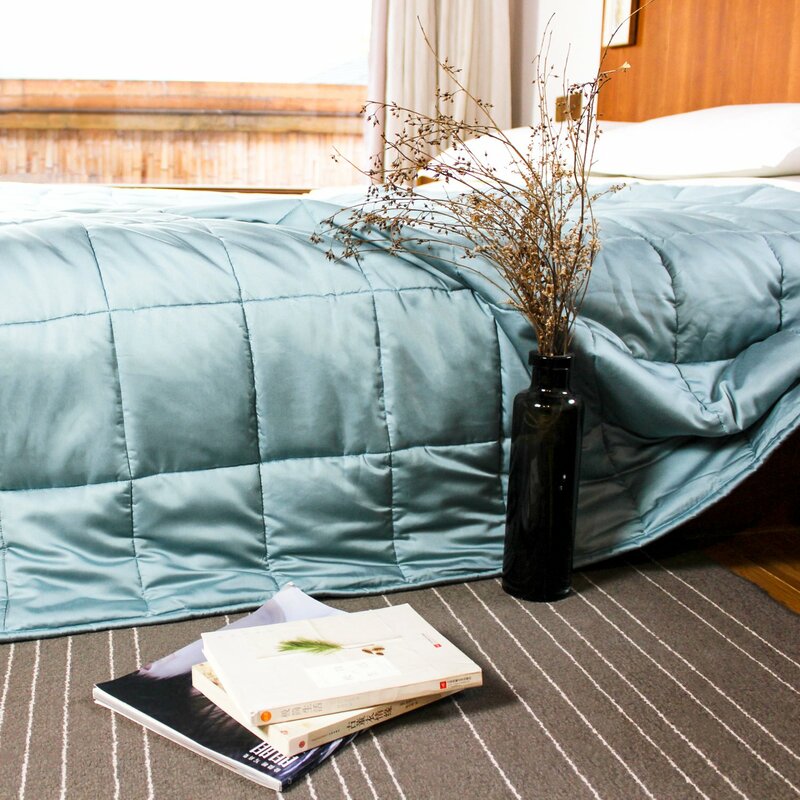 The YnM Cooling Weighted Blanket is made from 300 thread count bamboo viscose filled with thinner polyfill and micro glass beads (for the weighted element). It’s designed to help wick moisture away from the skin to help you stay cool and dry. It’s a popular choice and one of the most affordable bamboo weighted blankets currently out there. Available in 15, 20 and 25 lb weight sizes (here’s how to choose the right size). Keep in mind, there’s no removable cover included, but you can buy an additional bamboo viscose cover separately (not essential, but recommended). The truHugs Bamboo Weighted Blanket consists of a 100% cotton weighted blanket filled with micro glass beads, hypoallergenic fiberfill and a bamboo lyocell removable cover. According to the product details, the bamboo cover is hypoallergenic, antimicrobial, breathable and thermo-regulating. The blanket also meets OEKO-TEX Standard 100 criteria, an independent certification system that ensures textiles meet high safety and environmental standards. Available in 15 and 20 lb weighted sizes. 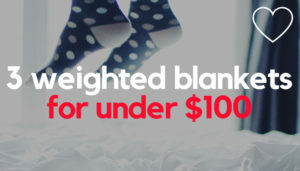 The YnM and truHugs bamboo blankets currently start at 15lbs, which is too heavy for your average child (here’s how to choose a blanket size for kids). 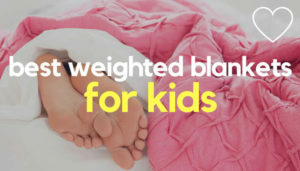 So, whilst it doesn’t contain bamboo, you might want to consider this popular COOLMAX Weighted Blanket from Weighted Comforts, since it includes a Mini COOLMAX version (7lbs), suitable for children who are sensitive to heat. Occupational therapists have been using the calming benefits of weighted blankets for years. A growing body of research also suggests deep pressure therapy may help ease insomnia and anxiety. 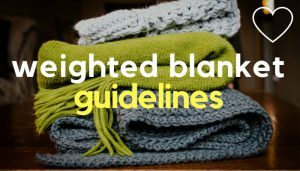 But if you’re a hot sleeper, live in a warm climate or don’t like manmade fabrics such as fleece, some weighted blankets may prove a notch too high on the temperature scale. This is where the thermo regulation of a bamboo weighted blanket can prove so effective, since the bamboo fibres will help keep you warm in winter, but also cool and dry when you’re feeling hot. Weighted blankets with bamboo covers are also lovely and soft to the touch, plus you should find they wrinkle less too.